Step into the Right Shoes! Choosing the right footwear is very important to avoid any kind of leg injury. There are plenty of highly fashionable shoes in the market for both men and women. Apart from keeping latest trends in mind, it is very important to see whether your feet are happy in the new foot wear or not. Did you know? With every step we take to walk, our body weight on our feet increases 3 times. And, if the footwear we use is not comfortable, it adds more pressure to ankle bones, joints and muscles causing aches and pains. Continued use of ill fitting footwear can lead to injuries as well. 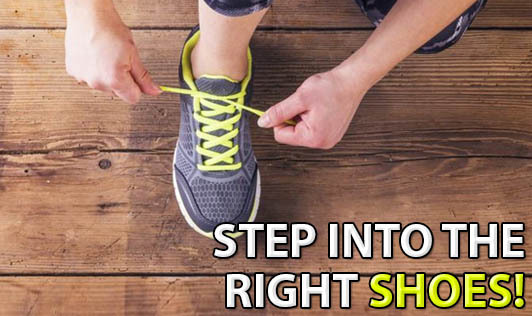 Here are few tips for you, to step into the right footwear! • Measure your feet: It is said that your foot size varies with age. Especially in women, after pregnancy. Shop for shoes towards the end of the day, when your feet are 5% to 8% longer than in the mornings. • Check the sole: The sole should provide enough cushioning and comfort to your heels and prevent it from slipping. • Look for toe space: If you are buying closed footwear, look for about ½" space between your toe and the tip of the shoe. If you use heeled footwear often, then..
• Go from high to low: Do not use high heels regularly. Altenate between high heels, medium heels and flats. This will dramatically reduce foot problems. • Cushion your heels: Buy shoes with cushioned insoles or youcan even use gel cushions that are available at your chemist store. If you are wearing high heels with gel cushions, it will support and reduce the strain on the balls of your feet. • Stretch your legs: After using heels, stretch your legs before going to bed. Especially your calf muscles to avoid any kind of stiffness. Certain pairs of shoes and footwear may look great. But, if it is uncomfortable to carry, and if it may leave you sore, do not use them. Treat your feet well , they have got to carry you a long way!